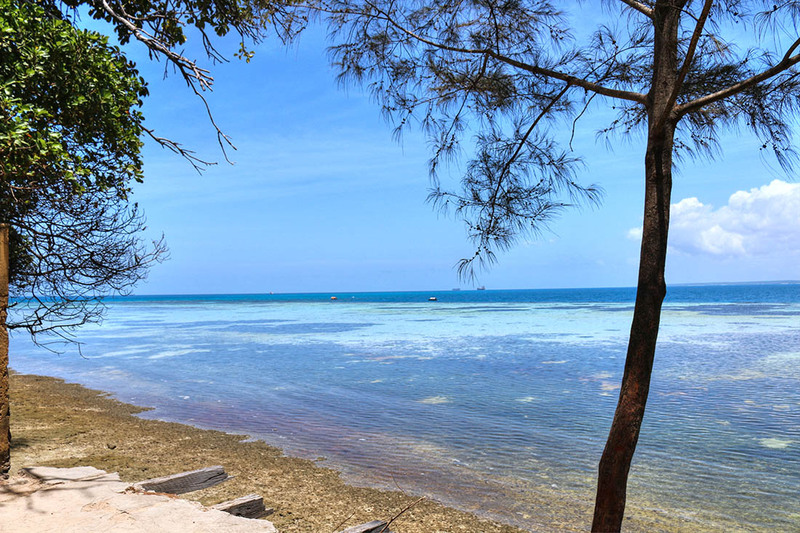 Surrounded by the pristine waters of the Indian Ocean, exquisite white sand beaches, coral reefs and covered in lush tropical vegetation is Changuu Island also known as Prison Island. 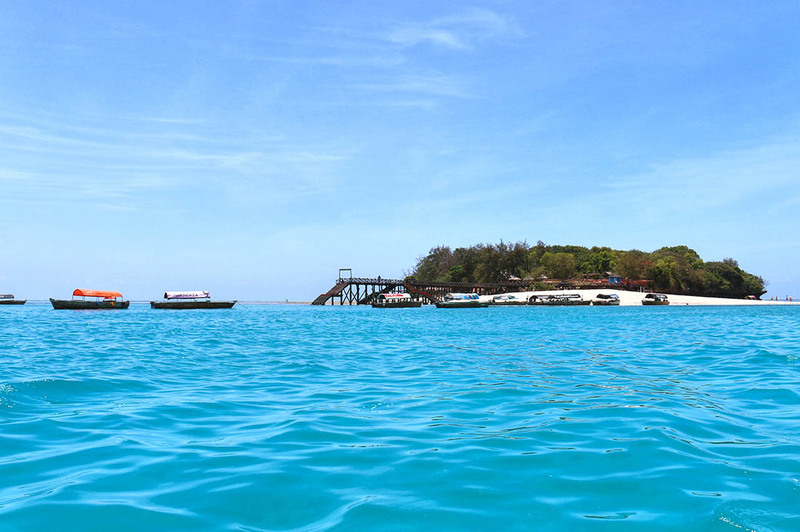 A 20 minute boat ride from Zanzibar, the island is named after a fish which is common in the surrounding seas. 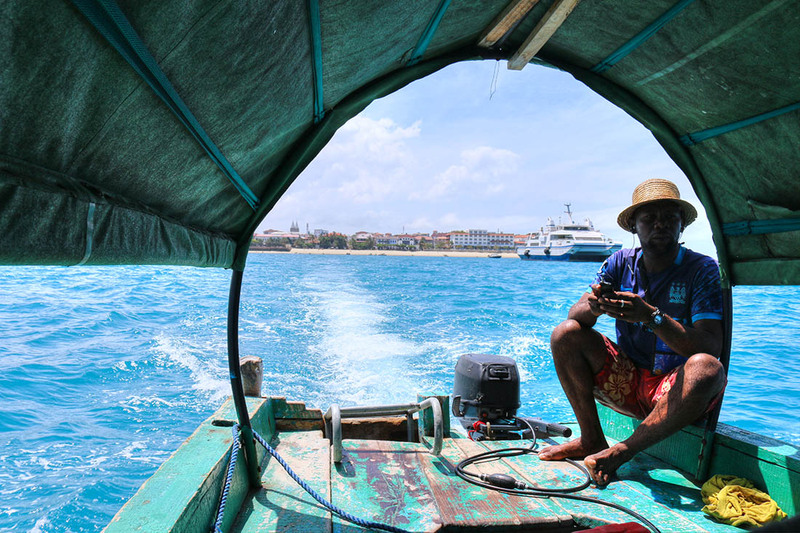 It is quite easy to get to the island, simply find your way to the beach in Stone Town (Zanzibar) and negotiate with one of the boat owners. I was with my friends so we paid Tshs 50,000 ($22.38) for 3 people for a return trip. I have visited Changuu Island twice, first time around in December 2015 with my friend Wendy and second time earlier this year. 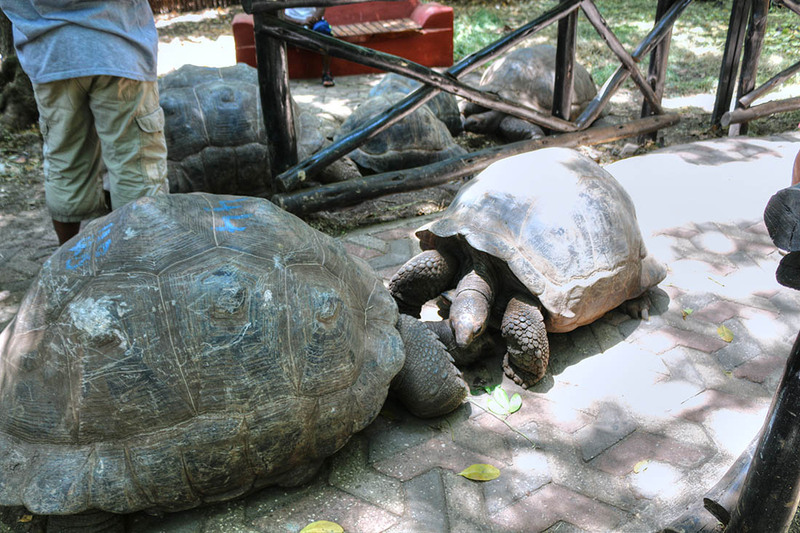 The island hosts a former prison and a tortoise sanctuary. You pay $5 for access to the prison and tortoise sanctuary. If you opt out from the prison and tortoise sanctuary visit and just want to take a stroll on the Island or to swim then you need not pay the $5 fee. The first time around Wendy and I got away with paying the locals/residents entry fee by claiming we lived in Dar es Salaam, and had ‘forgotten’ our IDs. I am a horrible liar so I let Wendy do all the talking, the ticketing guy didn’t seem entirely convinced, but we were successful in our quest to save our coins. My first trip I was without a guide, I recall the trip was pleasant enough, and would have liked to stay longer if it were not for one of our colleague getting unwell as a result having to end our trip early. This time round the boat owner served as our guide (at no extra fee) and to be honest added no value to the trip. Half the information he gave us about the island was incorrect while furthermore being grumpy and rushing us while we were enjoying our swim. You can definitely skip the guide, all the information you need to know about the island is on Google. 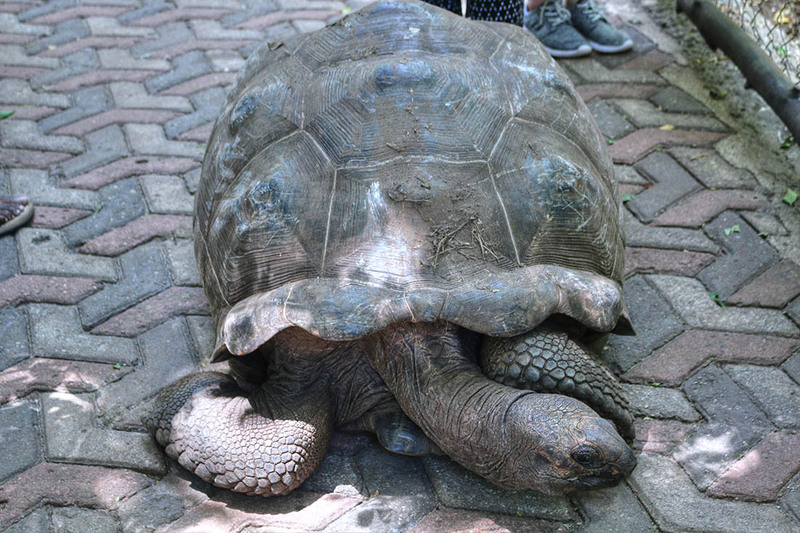 One of the major attractions in the Islands is no doubt the colony of Giant Tortoises. 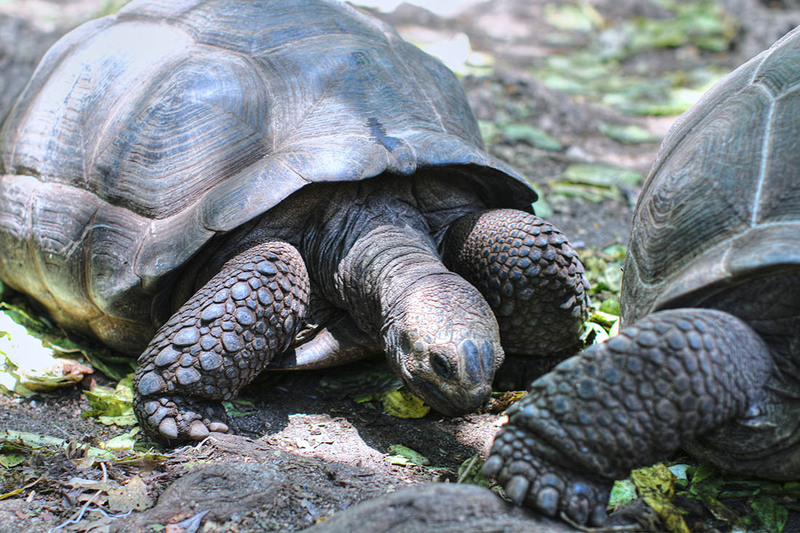 The island hosts a population of Aldabra giant tortoises (Aldabrachelys gigantea) one of the largest tortoises in the world. I got to watch this giants as they crept around languidly, while munching chunks of green strewn all over ground. 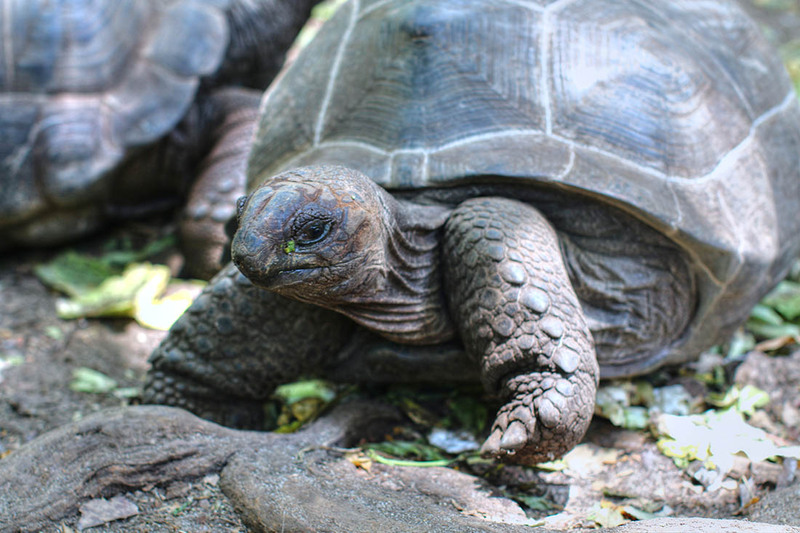 Aldabra tortoises are not indigenous to Zanzibar, originally from the islands of the Aldabra Atoll in the Seychelles, they were a gift in 1919 from the British governor of Seychelles to the first British resident of Zanzibar, Major F.B. Pearce. 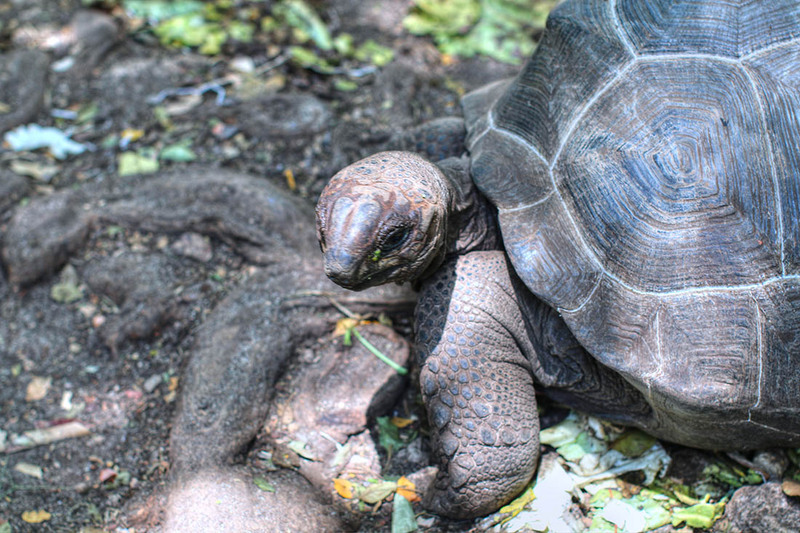 In exchange for the tortoises, a number of specimens of typical flowering plants were shipped to The Seychelles. The population grew quickly and by 1955 they numbered 200. 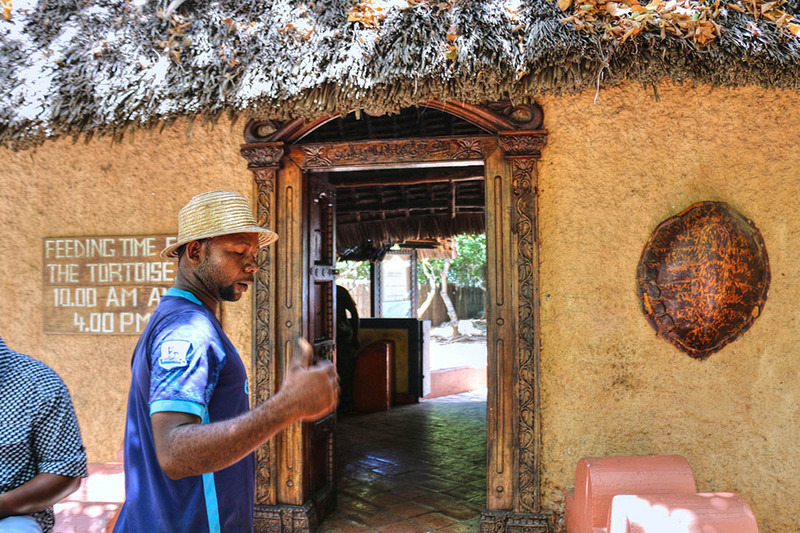 Soon the numbers began to drop due to poaching, eventually the Zanzibar government, with assistance from the (World Animal Protection) built a large compound to protect the animals where they reside peacefully to date. 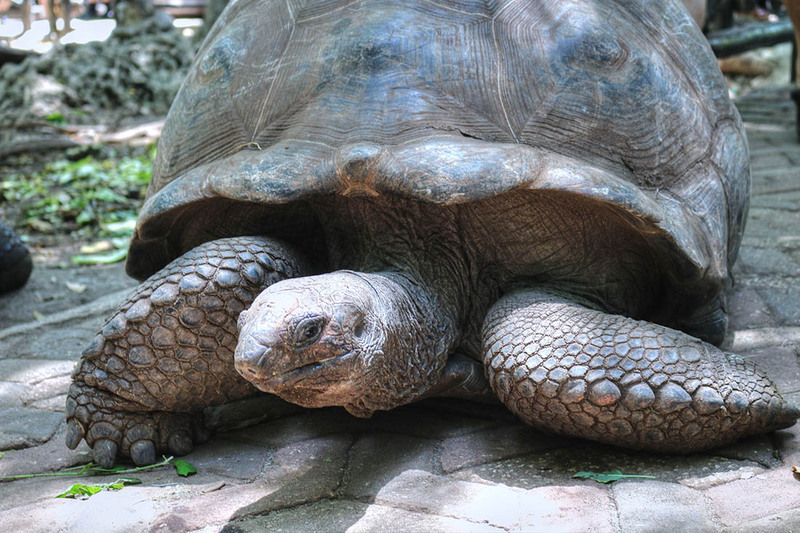 Some of the tortoises have their ages inscribed on their shells, the oldest is around 192 years old. It must be nice to live that long on an island without a care in the world. 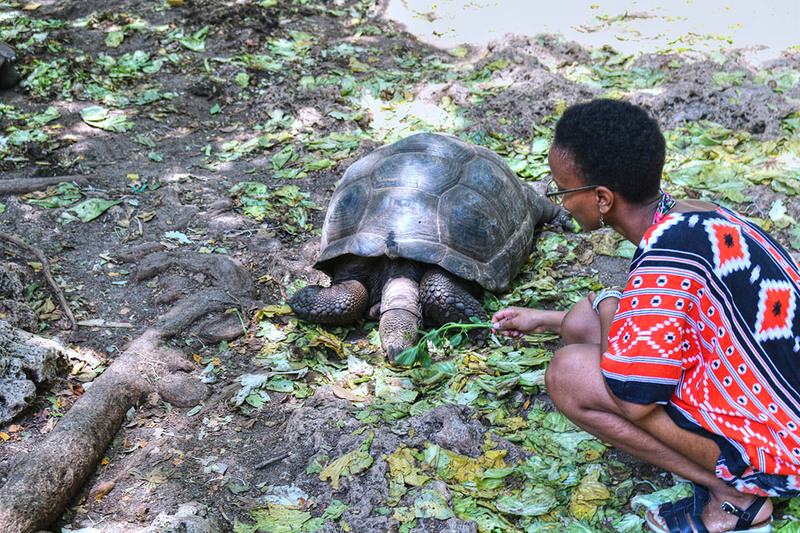 Care must also be taken when feeding them, as the beak of the tortoise is designed for cropping tough vegetation, and their jaw muscles are very strong. 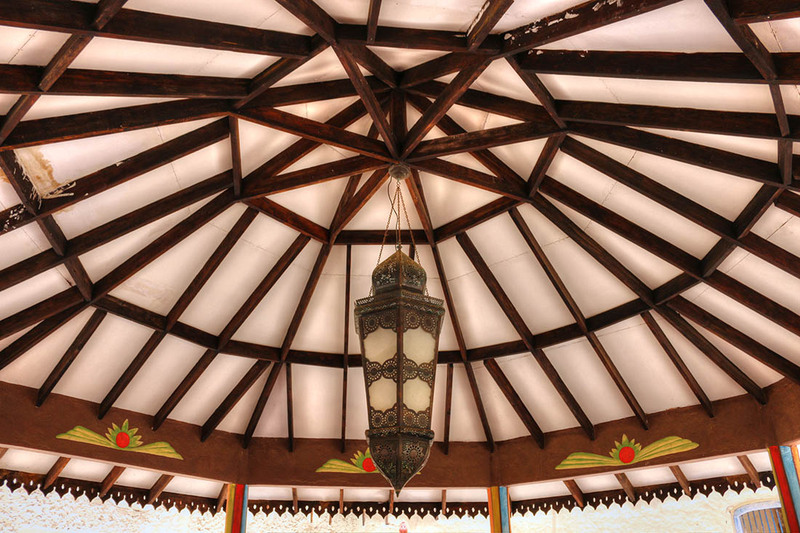 There is a restaurant on the island, however everything was so exorbitantly priced. One is definitely better off carrying their own food. Seafood salad for $12? I think not. 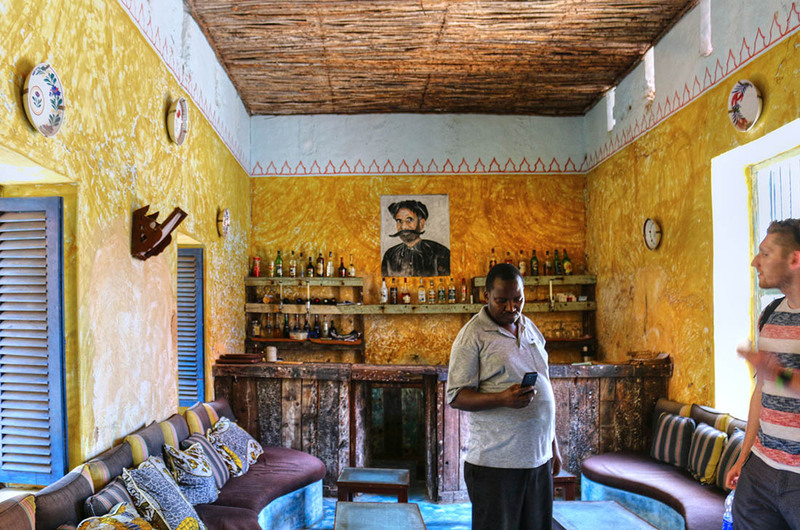 Changuu Island is part of Zanzibar’s intriguing history. A 5 minute walk across the island leads to the former prison ruins. 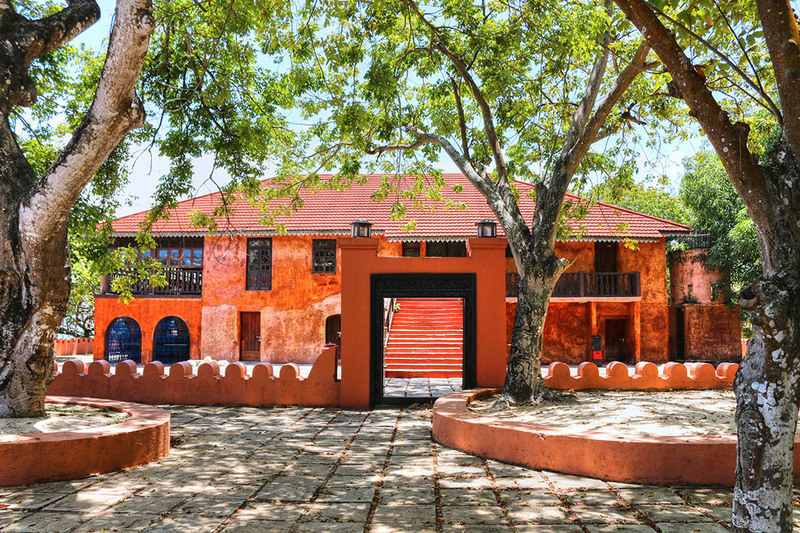 The island was used as a prison for rebellious slaves in 1860s and also functioned as a coral mine. 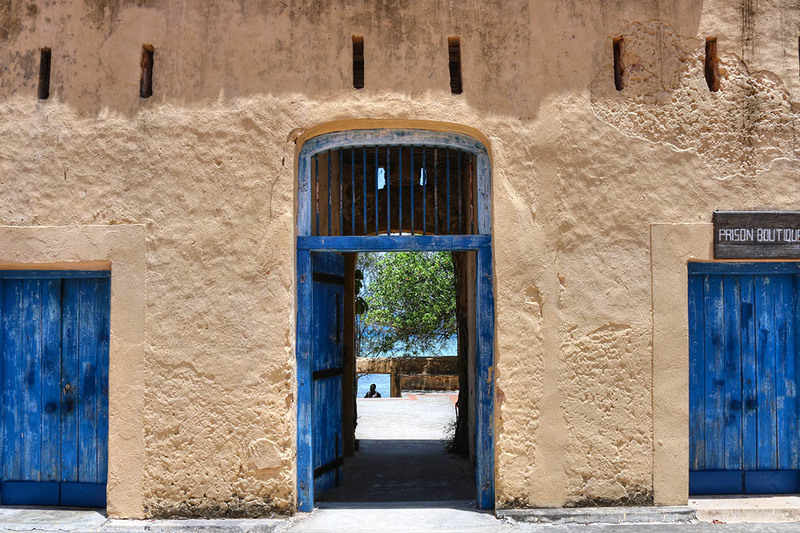 In 1891 Consul C.S Smith decided to reform prison conditions after visiting the main prison on the island of Zanzibar and being appalled by the squalid conditions. It was decided that a prison would be constructed on Changuu Island in order to decongest the prison on the main island. As with most government projects, progress was slow and the prison on Changuu Island was only completed in the mid-1890s. 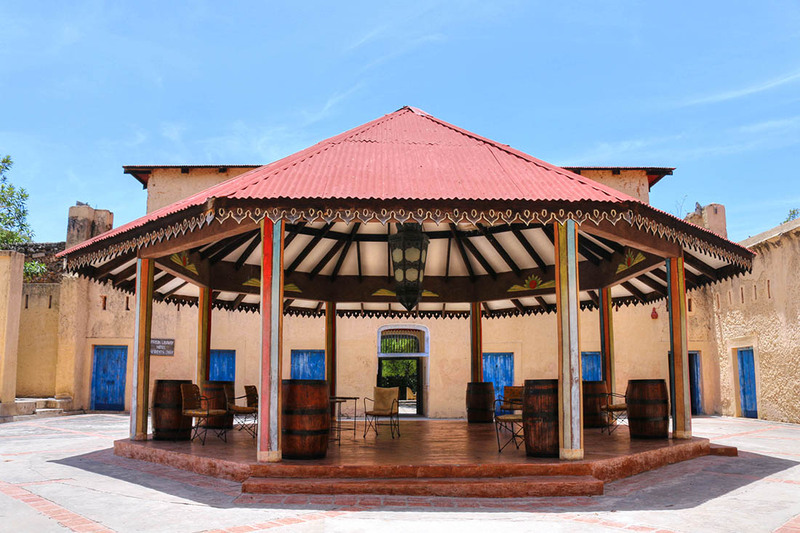 However, no prisoners were ever moved there so the buildings remained unoccupied save for the occasional use as a health resort by the European residents in Zanzibar. 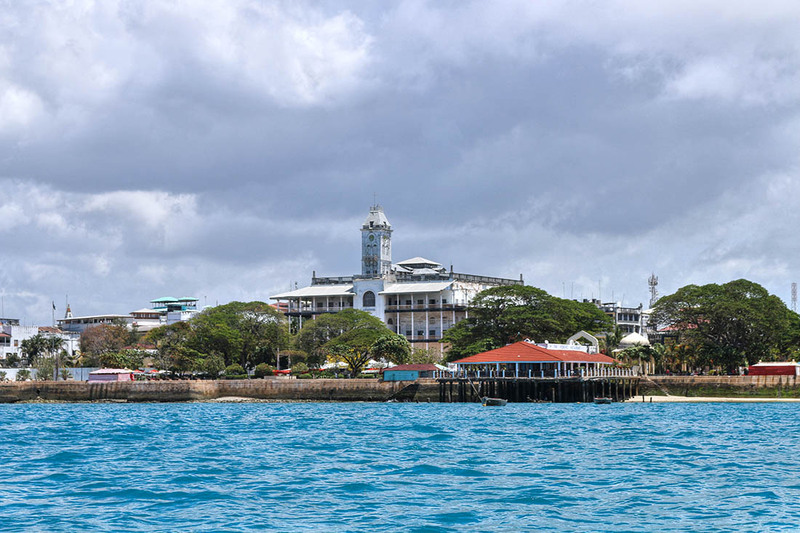 At the end of the 19th Century, the Island became the Quarantine Station for Zanzibar, Kenya, Uganda and Tanganyika territories. 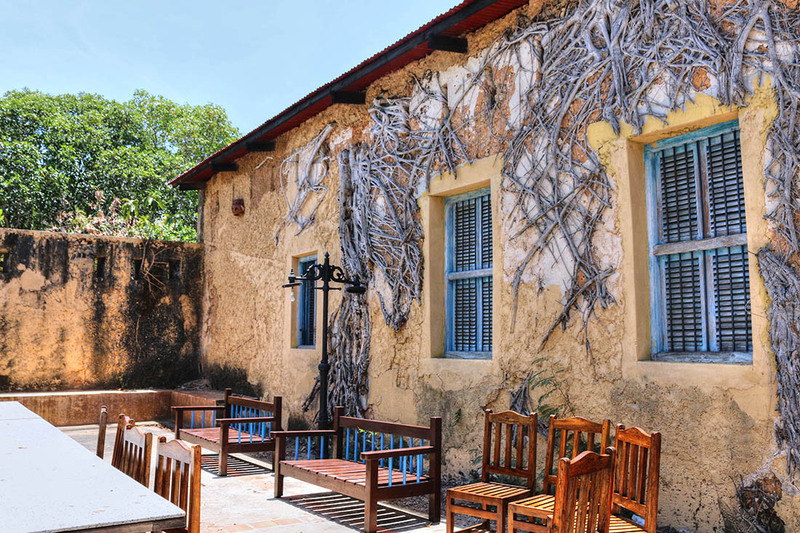 There was a massive outbreak of the plague in 1898 in India and with the large numbers of laborers coming to work on the East African railway there was the need for a regional quarantine station. Prison Island was selected and the prison blocks were re-purposed to accommodate travelers. By 1910 there was no longer a need for a permanent quarantine station but the island continued to serve this purpose. 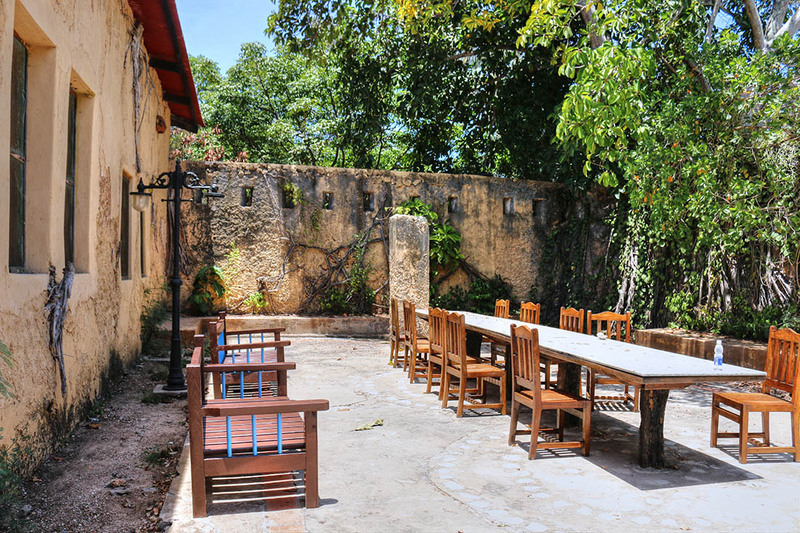 The building is now a hotel with 15 exclusive deluxe cottages located in the northwest side of the island and 12 elegant sea-facing rooms that were once part of the prison complex. 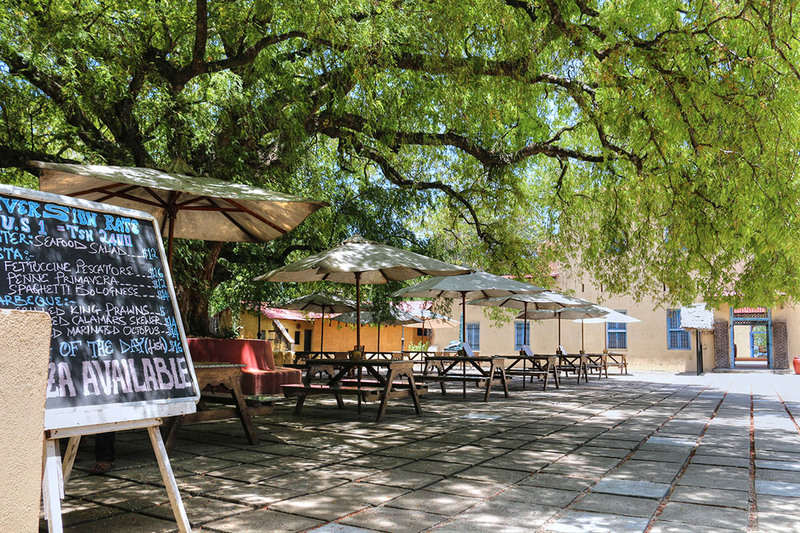 The sweltering heat in Changuu can be quite unbearable but fortunately there is a bar in the prison complex where you can stop by for refreshments. After a tour of the former prison (to the best of my knowledge, one cannot enter any of the buildings) it was time for a swim. 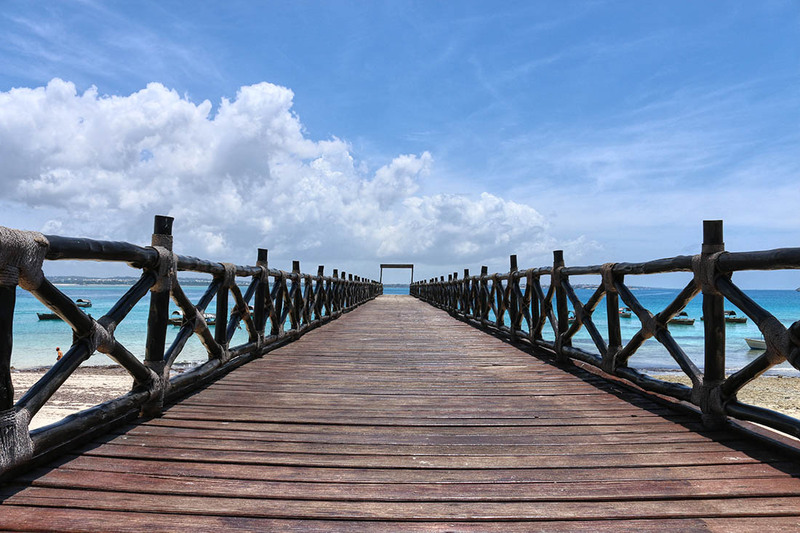 On the island is an iconic symbol of Changuu – a rustic wooden bridge that hovers a few meters above the water, jetting out into the sea. We didn’t get to swim long because for one our guide was in a hurry and strangely the water started changing color to a shade of orange. Our guide claimed it was the coral that had changed the color of the water. A self-walking safari should cover the island in less than one hour. 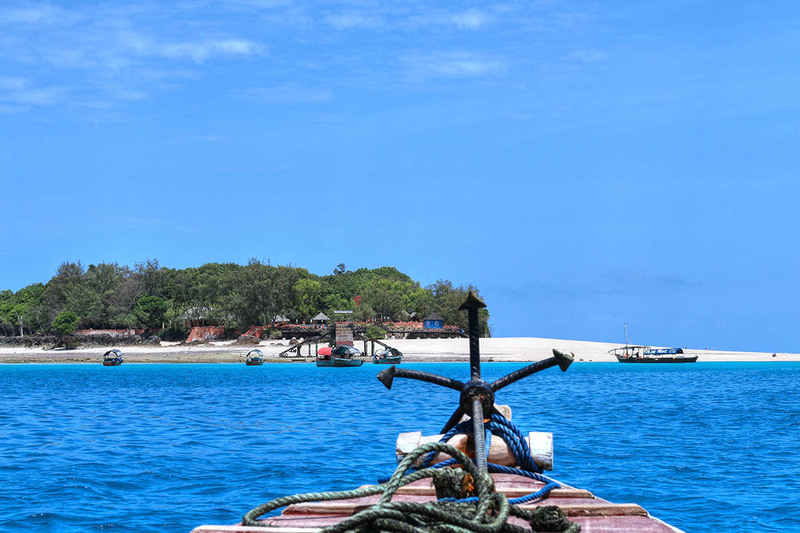 Changuu Island offers the visitor a chance to sunbathe, swim or snorkel in the clear blue waters. 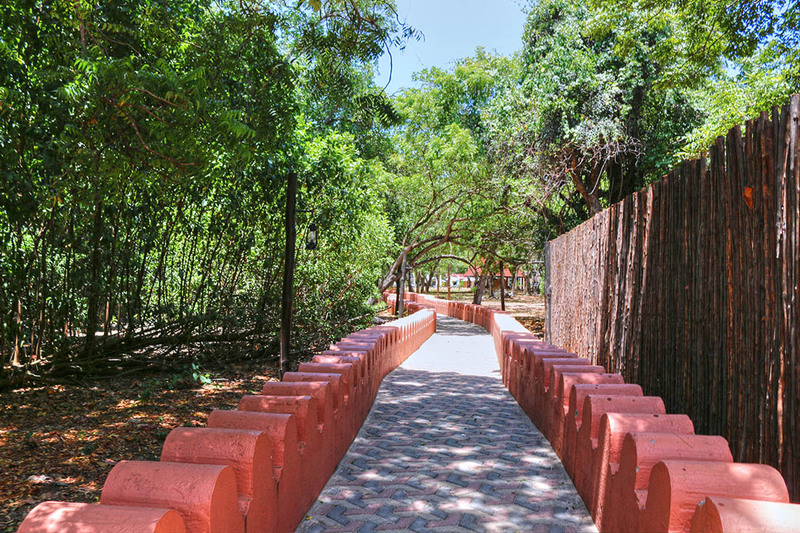 The Island is also endowed with nature with many trees and plants, and it is a delight to walk safely and unhindered. 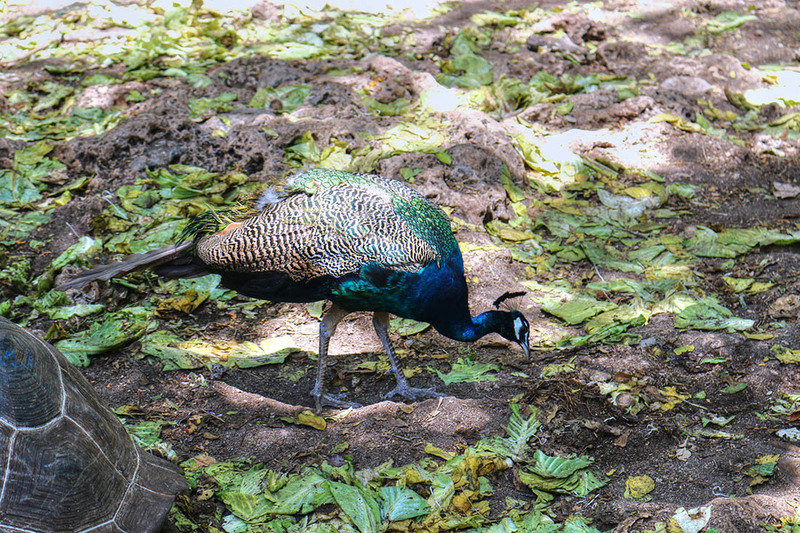 Avian lovers will relish a trip to the Island as there is a wide variety of birds, colorful peacocks, bats and beautiful butterflies. 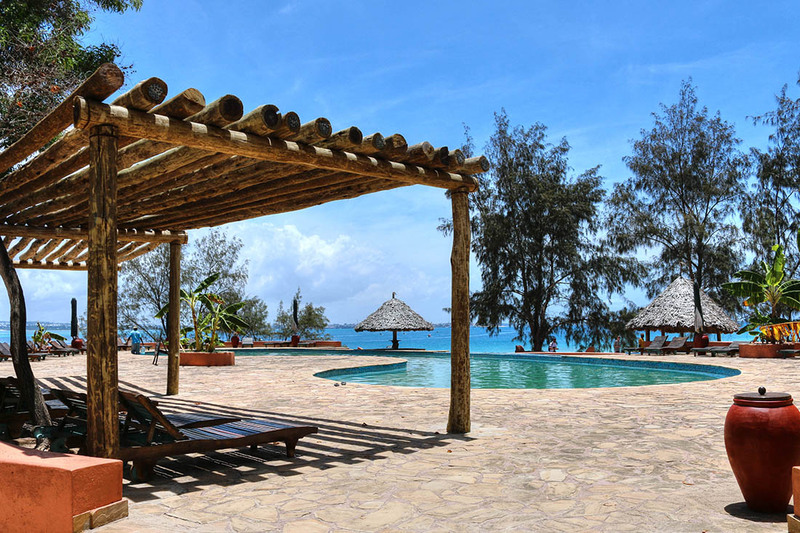 Most people choose to just visit Prison Island for a day trip on their busy schedules of Zanzibar, but if you choose to spend the night on the island, there is a private island resort where you can stay. 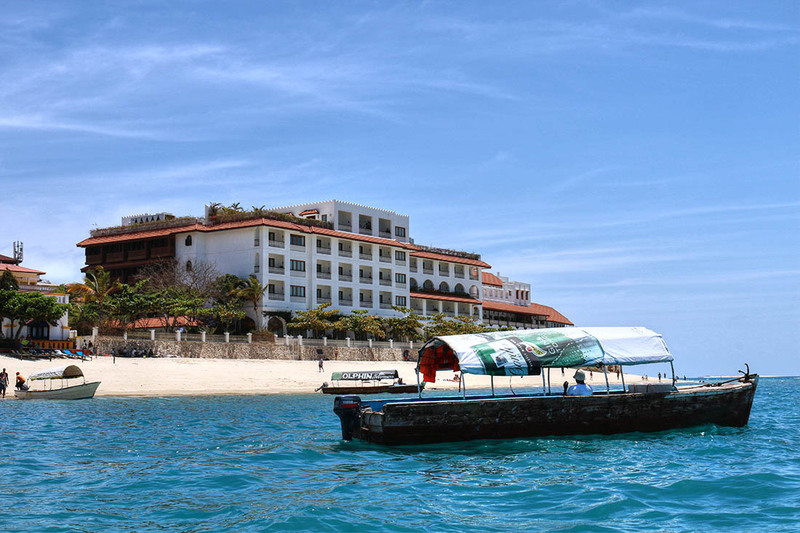 Tour companies in Zanzibar offer the basic same tour to Prison Island including boat fee, entrance fee, and snorkel gear. 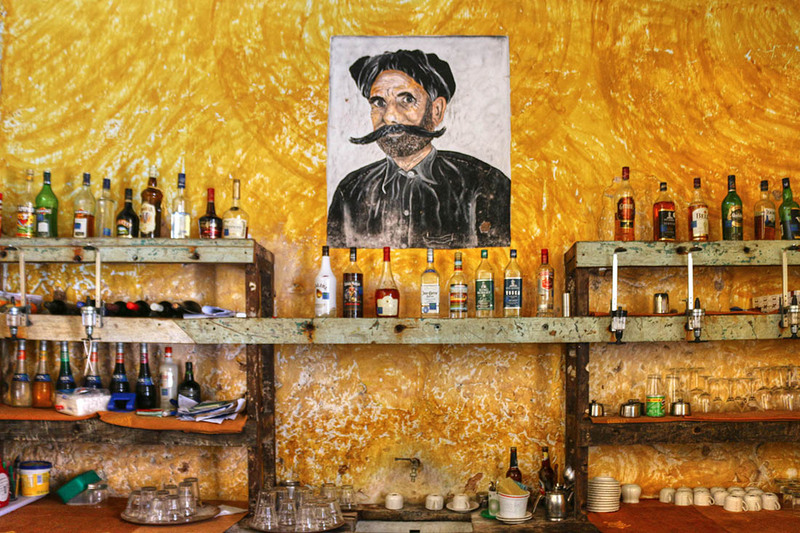 If you have a group, you can bargain to get a better rate per person. 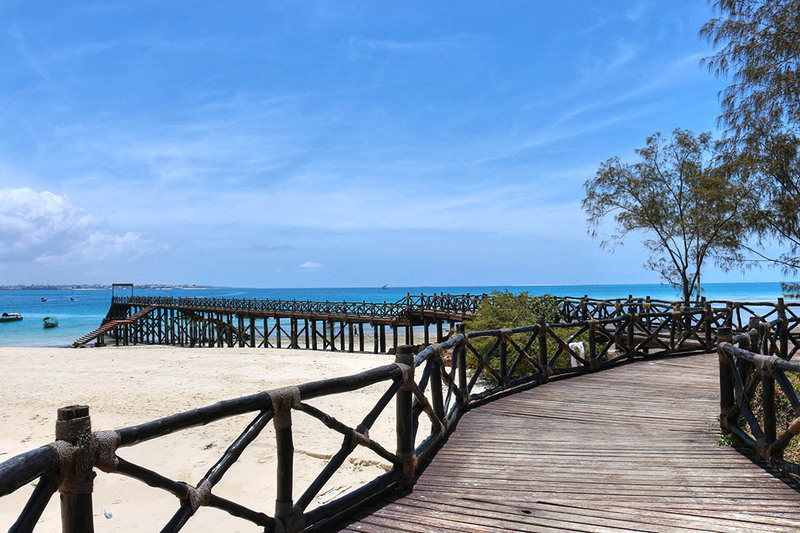 Additionally, most hotels or guest houses in Zanzibar will offer package deals for taking a 1/2 day excursion to Changuu. Zanzibar Prison Island the prison that never was.